'Cause he knows why the chicken crossed the road!" Opened 4/16/85 at the Mark Hellinger Theatre in New York. 79 performances. This musical had an original story. It's set in 1933 Chicago, in Harry Earle's Burlesk [sic] and the city. The burlesque house has two companies, white and black, and as the town is touchy about "mixin'," the companies cannot mingle on or offstage. The principal black characters are LeRoy, the comic, and Satin the stripper; the principal white performer is Gus, a comedian. LeRoy loves Satin but cannot express his feelings to her except in crude, offputting burlesque routines. Gus is going blind and is in danger of losing his career, so he enlists a helper, an Irish bum named Doyle, as his primary stooge. Doyle has his own demons, but he proves to be a useful addition to both companies. For one thing, he's the only person who can ride a bike, so he's picked to deliver a bike to the birthday party of Satin's little brother Grover. Unfortunately, toughs take offense to this mixing of white and black, and the bike is destroyed. LeRoy, unable to deal with the violence, retreats into a burlesque routine. Gus's eyesight is now too poor for him to continue performing, and he commits suicide. Doyle is devastated and disappears during the memorial service. Satin and LeRoy search for him, unsuccessfully; LeRoy is finally able to confess his love for Satin, who is thrilled, and they arrange to meet for dinner. But on her way to meet him, Satin finds Doyle, drunk and being set upon by toughs. She rescues him and takes him home. As he sleeps, he talks, and reveals that he was an Irish terrorist who accidentally killed his wife and son. Next morning, Satin returns to the theatre only to encounter LeRoy, feeling rejected. He humiliates her onstage and then attacks Doyle, causing the two companies to take sides (along racial lines) in the conflict. However, when those ubiquitous toughs invade the theatre, the companies become one company as they fight the common enemy. This show was an interesting mid-80s flop that I believe was Stubby Kaye's last Broadway musical. The plot is way overloaded and unfocused--it seems silly, for example, to give Doyle so much background and emotional baggage, when his function is mostly as a catalyst for the two companies to examine their relationship with each other. How did his past as a terrorist in any way affect what happens in the musical, except to make him vaguely mysterious for a while? Possibly they gave him this past because they needed another take on the word "grind." They already had grind in the "bump-and-grind" sense, the grinding down of spirits by the Depression, and the grind of daily performances; Doyle added the grinding of elements to make bombs. It's also possible that Larry Grossman had some nice Irish-sounding melodies that they wanted to include in the show, so they made Doyle Irish. Anyway, this is a classic example of a show utterly destroyed by book problems. Ken Mandelbaum suggests several ways that Prince could have salvaged this show, including by giving it the Cabaret or Chicago treatment consistently throughout, rather than only twice (at the beginning and when LeRoy reacts to the destruction of the bicycle and throws everyone but Satin into an imaginary burlesque routine by way of escape). The show does feel like a cross between Chicago and Follies with a little Ragtime and Gypsy thrown in, though in a lumpy and awkward way. Grossman was as unlucky as Stephen Schwartz was lucky. Here is a composer whose music deserves attention, yet all four of his Broadway scores were flops. His only success, such as it was, came with the off-Broadway show Snoopy!, which of course has been completely overshadowed by the earlier (and inferior) You're a Good Man, Charlie Brown. I have all his scores except Minnie's Boys, and I'm struck by the disconnect in the quality of the music versus the crap of the books. 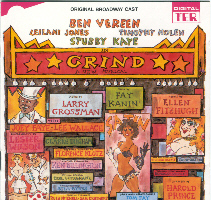 Grind is a snappy, always interesting, classic brassy Broadway score with some standout numbers ("Sweet Thing Like Me," "I Get Myself Out," "All Things to One Man," and the much-better-than-average overture) and more than a hint of burlesque rhythms. Of course, the mid-80s were not kind to classic Broadway scores... but it holds up quite well. Fitzhugh's lyrics are competent with a few good moments, but not much sticks in the memory. Jones is easily the class of the show (her "Sweet Thing Like Me" is an early knockout punch) and deservedly won her Tony. Carol Woods is shamefully underused on the disc, appearing on only one song, the well-received gospel number "These Eyes of Mine" sung at Gus's memorial service. (In general this talented woman is shamefully underused on Broadway. I saw her blow the house away in Follies on the "Mirror, Mirror" number, and I was thinking, "Who is she? Who is she?" I'm slowly learning.) The other actors are pleasant but unmemorable. Unimpressive. The booklet has basic details of cast and production, a plot summary, and a cast list. There are six captioned color pictures (decent, if a little dark and distant) inside and a rather fuzzy color picture of the company (looks like just the black characters, not the full company, despite the caption) on the back. For a song list and who sang them, you have to go to the back of the CD case. There's no production history, which would have been useful given this musical's status as a Hal Prince flop. This is one of the better flop scores available, assuming you can find it. It's worth a search if you're into flops, are a fan of one of the principals, or want to explore Grossman's music. I invite other examples, or comments about the examples above. All submitted material will be properly credited and copyrighted to the submitters. Please see the submissions page for more information.